Why not customize your home with some original, personalized MAJOR Moments pieces. With today's hectic schedules and family life, make your world easier with family meal plans and chore charts! Potty training and trying to keep track of incentives and rewards? Why not create a special piece to make your little one feel proud and track their success. The options don't stop there. 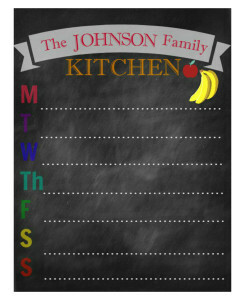 Why not dress up your child's bedroom or playroom door with a unique and custom designed name sign. Have a special idea of your own? Let us know and we can help you create your very own one-of-a kind MAJOR Moments board.